My name is Gary Waidson, but friends call me Wayland. I run a Living History business so it certainly helps people remember me, and it’s a good ice breaker too, but it is only one part of my life. The first thing I ever really wanted to be was a photographer. In fact I studied and trained for years to become just that, before discovering that commercial photography involved far too many compromises for my liking. I still consider myself a photographer at heart but these days it is the landscape that captures my imagination and eye. Since childhood I have had a love affair with the “great outdoors” and it is sometimes difficult for me to tell if I am in the wilderness to take photographs or I am taking photographs because I am in the wilderness. The wilder the places I find myself in, the more at home I feel. To get the very best photographs I like to totally immerse myself in the landscape and conditions. For me there really is no better way to achieve this than low impact wild camping. With the popularity of the recent television programs produced by Ray Mears, this approach, often referred to as ”Bushcraft”, has come to be understood a little more by the general public. 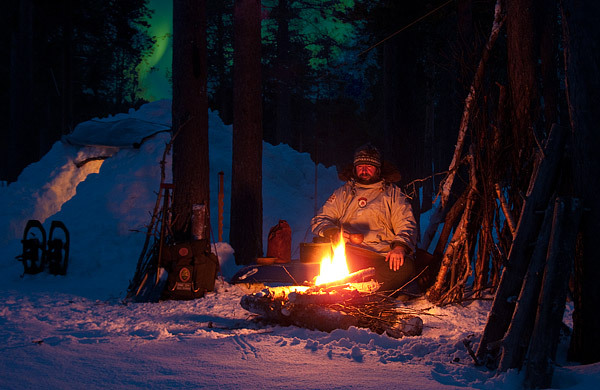 So often though, bushcraft it is depicted as ”Man surviving against the elements”. Little could be further than the truth. To me it is much more about ”Man in harmony with the elements” and seems absolutely the most natural way to get close to my subject. In these pages you will find links to www.waylandscape.co.uk my Landscape Photography site and also to www.lore-and-saga.co.uk my Living History site but this site is all about my approach to camping and outdoor living. 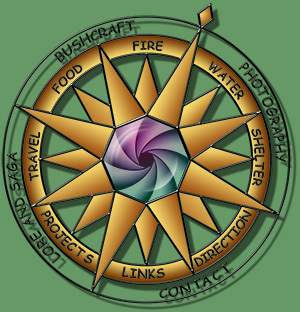 You can navigate the site using the text links, with the buttons on the right or with the Compass you can see above and below.